When there are thousands of PDF files received from your clients and it will be hard to check what these PDF say by opening and checking one by one. However, if we can get basic information of them and then save information in text file, things will go different. When checking those basic information, you can get a rough idea about what those PDF are about then you can know which should be set on top priority. In the following part, I will show you how to fulfill this function by VeryPDF Toolbox Command Line. Get one copy PDF Toolbox. All the VeryPDF software are free downloading and are absolutely clear, so you can rest assured to download it. And we will not charge you without your permission. Once the downloading finishes, please extract the zip file to some folder then you can check elements in it. There are three subfolders saved in extracted folder. Please find the executable file in bin folder. When downloading, please download the right version as there are three versions available:Mac, Linux and Windows. When you use this software, please know a little bit more about usage of this software. When you need to get basic information from PDF by command line, please refer to the following command line template. 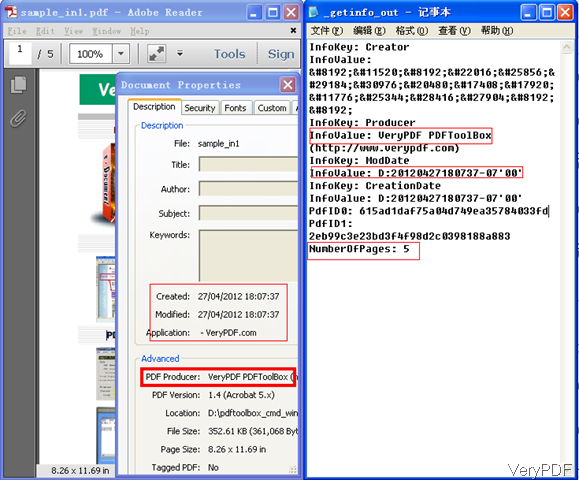 pdftoolbox sample_in1.pdf -getinfo -outfile "_getinfo_out.txt"
In the above command line example, I will get basic information from sample_in1.pdf and import basic information to text file "_getinfo_out.txt. And parameter -getinfo plays key role in the conversion, which extract statistics, metadata, bookmarks and page labels from input PDF file to the given output file. And when you specify the output file path, please do not forget to input parameter -outfile which can be used to specify an output file name. Now let us check conversion effect from the following snapshot. When you extract data in the text file, you can also use this software to replace data in another PDF file. And if you want to know this function, please pay attention to our knowledge base. Also you can use this software to work in batch conversion mode. Then the efficiency of work can be enhanced greatly. When run the batch conversion, you can either write bat file or use wild characters. If you need to know more function, please visit its homepage. And during the using, if you have any question, please contact us as soon as possible. This entry was posted in PDF Toolbox Command Line and tagged get basic information. Bookmark the permalink.